Moving doesn’t have to be stressful. The key to a stress free successful move is to be prepared. Whether you are moving across Tennessee or just around Nashville local movers can help. Depending on your needs movers can offer full service local moving, meaning they take care of everything from packing the boxes through the move to unpacking the boxes at your new Nashville home. If you want to be frugal yet still use movers, there are several things you can do to save money. 1. Pick a reputable company, you don’t want your movers standing around wasting time. Try to get a referral from a friend or coworker. 2. Have all of your boxes packed, taped shut, and labeled. 3. Take the beds apart and the mirrors off dressers but leave everything in it’s room. 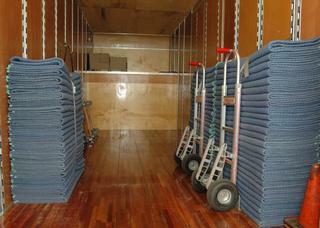 This makes it easier for movers to load the truck with the items they need for a secure load. 4. Make sure there are not random objects in the way, sitting on things that need to be moved, believe it or not moving those small things out of the way takes up time. 5. Put up your pets and help keep the kids busy so they are not a distraction. While carrying heavy furniture your movers can’t be watching where they step to avoid Fido, and kids are always fascinated with the ramp on the truck! Hopefully your next move is a success! Please visit our website for more great ideas! What are some things you do on your moving day to help save time and money?